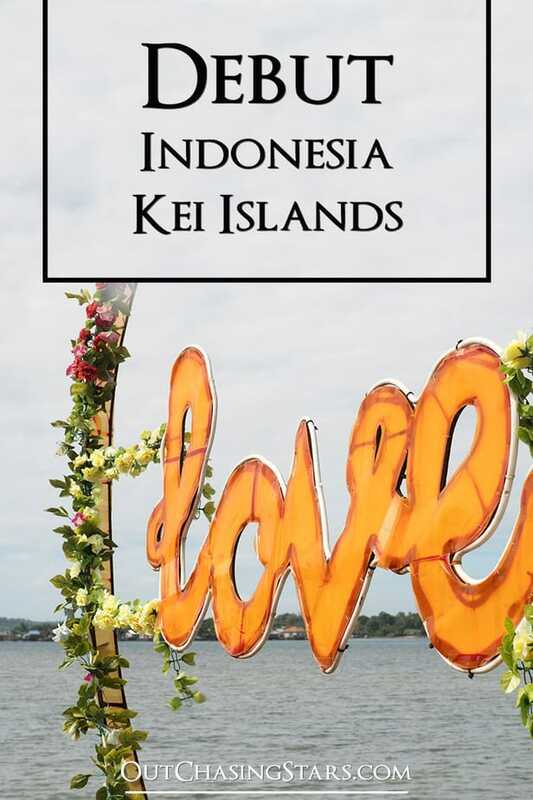 After four days sailing from Australia to Indonesia, our arrival port in Indonesia was Debut, a small village in the Kei Islands of Indonesia. 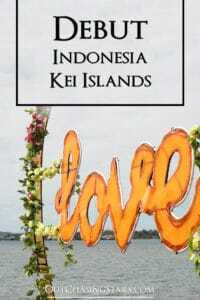 This area has many islands, and Debut is on Kei Island. The main town is called Langgur, and only a small channel is between Kei Island and the next door Dullah Island. Dullah Island’s main village is Tual, and Tual and Langgur are both very close together, connected by a short bridge. All of this is part of the Maluku Province of Indonesia. Watch the Video: Time to Clear In to Indonesia! The main airport for this area is the Langgur Airport. Since I haven’t been to Tual I can’t really remark on Debut v Tual. Debut was a good anchorage for us. It is wide with good holding in about 15 feet. There was plenty of room for all the rally boats. The charts are absolutely terrible, and the information from the rally was also inaccurate. Several boats hit bottom while coming to anchor. It pays to have good visibility and a spotter on the bow. Most of the rally fleet in Debut. The water is murky and very dirty. Already Indonesia is living up to its reputation of being a landfill. Many cruisers opted not to use their watermakers here. The wharf in Debut is a long, fixed pier. On the northwest side of the pier, there is a wide set of stairs going up to the street. On the east side of the pier (the windward side), there are a few small staircases from the low water line to the wharf. The big problem is that the stone of all the stairs is very slippery, and the tide can be as much as 1.6 meters. At high tide, it’s easy enough to get on and off the wharf from your dinghy, but at low tide, there’s no way you can make the jump up or down. If you tie up to the windward side, your dinghy will get blown under the wharf and onto the pilings coated in sharp bivalves. Don’t worry, the people of Debut have a very unique solution to this that provided the local kids with a task and gave us some entertainment. There is ALWAYS someone at the wharf who was willing to help us. If you come to the wide stairs, someone will take your hand, caution you about the slick steps, and help you push your dinghy out and walk the painter (the lead) out to the wharf to tie up. If the tide is high enough and you can come to the wharf directly, someone is always there to take your line and give you a hand up. One night we came back from the festivities and the tide was very low (and it was completely dark out). The local kids to the rescue! The kids would hang like monkeys off the wharf and drop down into the dinghies. Their friends would release the painter. The kid in the dinghy would get out a paddle (even if your paddle is in the caulks, they know what to do) and paddle over to the wide steps. What floored us, of course, is that no one is asking for money. They are not putting their hand out afterward and expecting a tip. It’s like a yachties valet service! On the south side of the anchorage is another small rundown wharf. On the west side of the wharf, there is a small beach to land at and tie up your dinghy. We only used this once, but it saves a lot of time if you are going south. The people of Debut made the stop absolutely fabulous. It was a very positive (although sometimes tiring) introduction to Indonesian people and culture. Unlike some countries we have been to, the people are not shy. Everyone smiles and says hello…even just a few minutes after anchoring we had a canoe pull up with three boys who wanted to talk to us. In Debut, almost everyone knows a little English (hello, good morning, thank you), but the kids are learning English in school and want to practice with you. Don’t be surprised when they remember your name and shout it every time you come in. They have a few phrases they like to use: what is your name? You are beautiful. What is your religion? We connected with the kids by asking: what is your name? how old are you? and asking for high-fives, which every kid lines up to do while giggling. This area is mostly Christian, and we can see several churches from the anchorage, but we can also see several mosques (for the Muslim people) and we found a pura (Balinese Hindu temple) that looks abandoned. One of the huge culture shocks for us is that EVERYONE wants to take a picture with the bule (tourists/white person) who are visiting. It’s hard to go ashore without being stopped for photographs several times, especially when you are a young woman. It can start to feel overwhelming. The preteen girls like to ask for kisses on the cheek, and sometimes they even want to have their picture taken with you on YOUR phone. It was the same for the kids visiting in canoes, and it was especially bad over the weekend when they didn’t have school. The kids are constantly coming by and wanting to talk to you or play on the boat. It sometimes made it hard to get work done, and you have to get used to saying no. One time David invited a group on board while I happened to be making some ice waters for us. I passed out small chunks of ice which were very popular. Sama Sama: You are welcome. In most entrance ports, clearing in procedures can vary greatly by boat. Debut is not a regular port of entry for Indonesia, but for some reason (maybe because the anchorage is so big? ), the rally stops here and the officials come from Tual to Debut for about a week to get us all cleared in. First, when we arrived with our Q flag up, Quarantine would come by and check us in. Even though we arrived at 2 pm, Quarantine was not to be found the whole day. And the next morning, they were not there. Thankfully, we got word that it was ok for us to come ashore and attend the welcome ceremony anyway. After the ceremony, we found the officials and went back to our boat. Quarantine came by with three people in a long boat. As they were approaching I think their engine died, and the motor gave SH a good whack on our bow, leaving a scratch. Once the officials got onboard, standard questions were asked and paperwork was filled out. For the first time EVER, our medical kit was searched and they asked for a copy of our inventory. Most of our prescriptions are expired, and they put each expired prescription aside. Then they asked for a bag and tape. I gave them a gallon zip-lock bag, which they put the prescriptions in and then taped up. They said not to use these drugs in Indonesia, but once we left it was ok. The bag was not sealed in any formal way. They didn’t even finish going through the prescriptions, just filled a bag and that was good enough. Next was Customs. This boat brought TWELVE people on board. Half the people were in an official capacity, and half were in street clothes…who knew what they were doing. I filled out paperwork while David showed the officials around the boat. The officers filmed and took photos of everything, but it was not the most thorough inspection we’ve ever had. The next day, we went ashore to meet Customs and Immigrations to finish our paperwork. The officials were set up in the pavilion every day, and we sat down to finish our paperwork and get our passports stamped. Tip: when you get a document, make copies of it right away. Some people gave their Australian departure paperwork originals to the agents and then had to scramble to get them back later. Also at the pavilion was tables set up to assist with necessities. You could drop off laundry, get jerry cans filled, and talk to someone from the local tourism department. A money exchange van was set up with a good rate, and a Telkomsel van to give us sim cards. Tip: it sounds like propane or cooking gas is going to be very hard to get filled in Indonesia. Unfortunately, our US bottles were not legal to get filled in Australia. We might have chosen an illegal route to fill our tanks while in Australia….but we do not have the right fitting for the Indonesian tanks to do a gravity feed. So, we are glad to have full cooking gas tanks that will last us through to Malaysia. For the welcome ceremony, a tent was set up in the street with rows of chairs for us distinguished guests. There were a lot of government officials in attendance, and we had a short ceremony where coconut water was blessed and sprinkled on us and then a group of women danced for us. Most of the rest was lots of speeches by the government people, some of which were translated and some were not. Everything was filmed, and before we got too antsy a snack box was passed out, giving us a tasty snack of pastel goreng (fried pasties filled with rice noodles) and a slice of some kind of sweet loaf bread. In the early evening, we met at the wharf and were piled into buses to take us to the Grand Vilia Hotel in Langgur for an information session and dinner. Frankly, the evening was very boring. I’m sure that there were some very important people in the room, but most of what was said was either not translated or said in accents too thick for us to understand. We were given the opportunity to pose questions to a panel from a variety of offices, but there were often communication issues that made the answers unclear. The whole event was rather boring and stuffy in the fancy hotel ballroom. 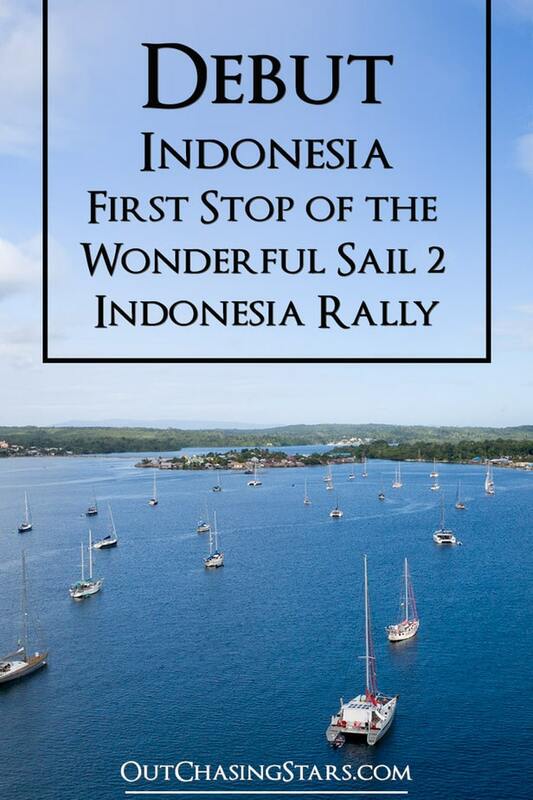 Welcome banner for the Wonderful Sail 2 Indonesia Rally. We did get treated to a nice buffet where we were introduced to some new foods like telur balado (hardboiled eggs with chili sauce) and several other dishes I haven’t been able to identify (plus some classics like tempura shrimp and fried spring rolls). Unfortunately, the return bus situation was very unorganized, and we ended up waiting nearly an hour out front of the hotel for a ride back to the wharf. The next evening, all the cruisers met at the Tetoat dock for bus service to a village called Wab. While waiting for everyone to gather I wandered over to the beautiful Masjid Al-Munawaroh mosque and encountered a group of women practicing military marches. One of the local youths told me they were training for the police service. After a 20 minute ride, the buses pulled over to the side of the road and we all got out. The street into Wab was lined with flags and people, and we became part of a parade! This time, large groups of schoolboys performed versions of the traditional cakalele dance, a warrior’s dance with weapons while accompanied by rebanas (Indonesian drums with open bottoms), cowbells, and a suling (traditional Indonesian flute). We had another coconut water blessing, and a short speech before heading down to Wab Ngufar Beach, where a large open area was cleared for performances. At least 400 villagers were in attendance. Girls danced for us and there was some singing before a buffet full of more Indonesian food adventures: lat (salad made with coconut and sea grapes), tumis bunga pepaya (stir-fried papaya flower), grilled fish, bbq chicken, etc. The music continued with a woman singing a mix of American music (like Honky Tonk Woman) and what I assume was popular Indonesian music. The locals were encouraging us to dance with them, teaching us some line dances and partnering up with us. It was a lot of fun to see our new friends dancing. Before we knew it, it was well past cruisers midnight and we were all exhausted. We loaded up onto the buses to head back home. After the Welcome Ceremony, there was a village tour offered which we had to turn down since we wanted to get our clear in done. The next day an island tour was offered, which we also turned down, as we wanted to get our errands done. Frankly, I have no idea how we could have managed to attend these events, as we were exhausted enough from all the day’s festivities as it was! I ran several times in Debut, starting at the wharf and turning left. Before long, my path along the water turned into the jungle, and about two km from the wharf I encountered this fabulous pura, a Balinese Hindu temple. Since most of the island is Catholic, it makes sense that there is a big Catholic church front and center from the wharf. We took a peek inside to see what it looked like. I have no idea what RPM is, but I saw this spot from the boat and had to go check it out. Google Maps says it’s a cafe. Whatever it is, there’s a raised boardwalk over the mangroves with treehouses and individual huts overlooking the water. The whole thing is lit up at night and maybe there’s karaoke? But I was drawn to the adorable heart & love sign! There are a few small stores in Debut where you can shop. The stores have mostly candies and cookies, but there are also small bakery items, eggs, garlic, shallots, beer, and more. Through the local rally people, we organized a taxi to take 5 of us (us, Slow Flight, and Craig from Il Sogno) into Langgur for shopping. The most important stop anywhere: the fresh vegetable market! Next was SIM cards, which took a lot of work. We ended up getting the Telkomsel cards and having to top up using Ding.com. There appear to be issues with our US cards to top up using the Telkomsel app. Our taxi driver took us to Forganza Cafe for lunch where we ordered lunch for six: nasi goreng (Indonesian fried rice, the national dish), mie ayam bawang biasa (basically chicken flavored ramen with fried onions), and more lat (which was better than the lat at the buffet…sweeter). With all that food, 6 beers, and two bottles of water, our lunch came to 373.000 Rp, or $25 USD. The restaurant’s quiet location made it well worth it. A short taxi ride from the wharf is the Goa Hawang, or Hawang Cave. This freshwater pool inside a cave is very popular as it glows when the sun hits it just right. Ohoidertawun Beach is a huge, picture-perfect beach with white sand and a swing set for a photo op. Ngurbloat Beach is to the north of Debut, and another beautiful beach to go check out. The Indonesian government used to require yachties to clear in and out of every port you visited. Now, through the rally, we clear in and out of Debut, and then you aren’t required to check in again until your last port. 24 hours before departing Debut we were required to come in again and clear out with Quarantine and the Harbour Master. The pura temple was definitely a highlight for me, and I’m sure will be memorable as my first Balinese temple. The people have been fun, but after a while, it’s tiring to get mobbed when you go to shore. As expected, there is a terrible trash problem around the village. I think the homes and yards are clean but the public spaces are completely littered with trash. A lot of the locals smoke, and the streets have the worst stray dogs we’ve ever seen. The dogs are thin and most of them have horrible mange. After six days in Debut, we set off westbound. Most of the rally fleet has gone already, we are one of the last of six boats still here. We are going to stop at the Tayandu Islands, an uninhabited part of the Maluku group, before heading to Banda Islands, part of the Maluku Islands steeped in colonial history. Great reading Amy. I agree with Peter. Andy scotts book is the best guide for Indonesia. Enjoy Indonesia your way. Only do the Rally events that interest you. 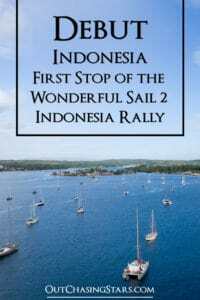 Very well written ,we did the rally in 2017 and left our boat at Lombok .we have been flying back and sailing every season since and still here ! 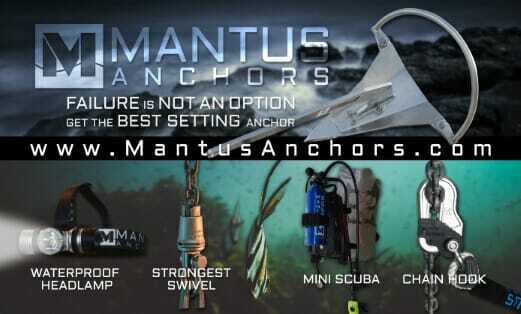 Off the record my tip would be to explore Indo using Andrew Scott Cruising guide – you will find some absolute fantastic anchorages in contrast to Anchorages outside cities that are convenient for the co ordinator to fly into and can accommodate 40 boats . Breaking away from the rally was the best thing we and others did as the endless festivals soon become tiresome . Please understand I am not anti Rally ,but I just want the cruisers to have the best experience rather than a quick “transit ” through to Malaysia! I think we can definitely relate to a lot of what you have said. We do have the Andy Scott guide, plus the Compendium. What are some of your favorite stops?